The Mini-Wheats Marathon Doily, day 3. I figure I have 16 hours in this baby so far. I worked on and off all afternoon Sunday, got about 3 rows completed, the third finished on Monday around 11:30. I’m real happy with the results, but there are now 3 boo-boos, none of which matter~ it will be under some piece of pottery, no doubt and no one will be the wiser. While I was working on the doily, I noticed I was nearing the end of my ball of thread. Then I noticed a piece of paper, folded and tucked inside the tube. I pulled it out, and opened it up. It was a note, hand-written by my dad on the day I flew to California to see him while in hospital. I’d forgotten I had put it there, for safekeeping. Dad was in the hospital the night I flew in, and as soon as I entered his room, he handed me a piece of paper with some writing on it. He had lost his voice after almost a year of battling with one-and-off treatments for what we thought was Tuberculosis. His note confirmed my worst fears; the Doctors said his cancer had progressed more rapidly than they expected, and chemo was no longer a viable option. I was floored when I read that note, there had to be a mistake. I had flown out to help dad get back on his feet, and now a Dr was telling me Dad had only days to live. He went home the next day and I lost him 5 days later. I put that note inside that ball of thread right after my Life-Sis in California went out and bought me a bunch of balls of thread, some hooks, and well-wishes as I prepared Dad and I for what were to be our last days together. In between sleep, and periods of deep contemplation, I sat by his side in the living room where we had his bed set up. I talked with Dad, doing most of the talking myself-his voice was a bell, which he willingly ignored for the most part. I crocheted fan pulls by the dozens, and gave one to every person who’s path crossed ours during the next week. Every knot had a prayer for Dad, and for our loved ones, worked into every stitch. He stayed awake long enough to watch the SF Giants ALMOST win the Pennant that year. After they lost, he stopped watching TV, and would spend hours just staring at an oil painting of some unnamed Italian villa my mom had bought when he was stationed overseas in the ’60’s. I think he was putting himself in that painting, or maybe he was looking for his family in that painting, because on the 5th day of his stay, he slipped away into the late evening, and went Home. 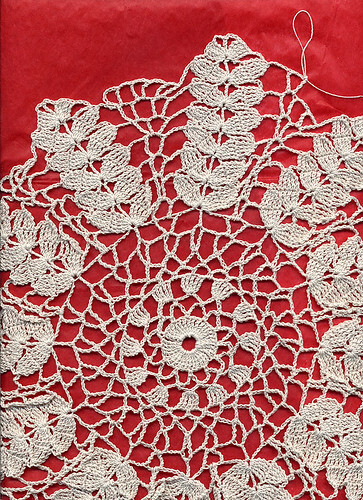 I was going to gift this doily, once it was completed. But now, I’m not sure what I will do with it. I suspect I will add it to the other memorabilia on Dad’s Chest of Drawers, in the Guest Bedroom, right next to Mom’s Urn, which sits upon a small doily I made while she was in the Alzheimer’s Home. I’m really glad I found that note, for that ball of thread had been tossed from one basket to another, over the past 6 yrs.